In Russia, Epiphany Comes With A Shockingly Cold Swim : Parallels To celebrate the feast of Epiphany marking the baptism of Jesus in the River Jordan, thousands of Russian Orthodox faithful take a dip in icy waters. How does it feel? "Absolutely good," one man says. 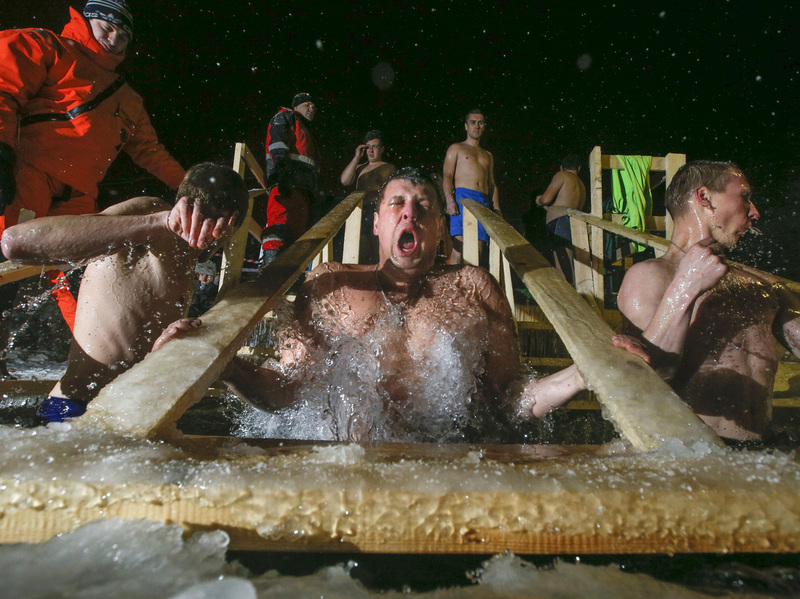 Russian Orthodox believers swim in frigid water at a pond outside St. Petersburg in the wee hours of Tuesday morning. Warmly dressed emergency medical technicians stand by in case anyone is overcome by the cold. Tuesday was an important holiday in the Russian Orthodox Church: Epiphany, which celebrates the baptism of Jesus in the River Jordan. 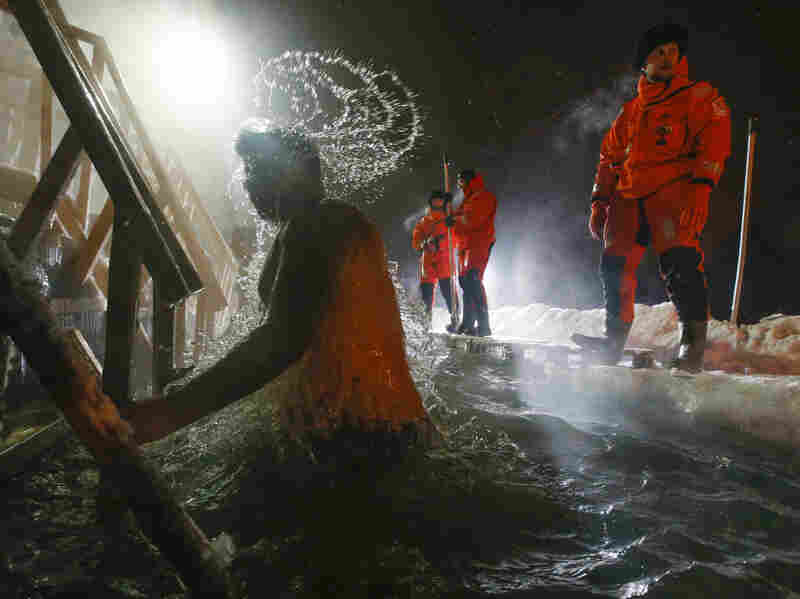 Russian believers mark the event by re-enacting that baptism in ponds and rivers, and since Russia is far north of the Jordan, that means plunging into freezing water through holes cut in the ice. Big cities like Moscow often set up elaborate stations where people can take the plunge, but people in other cities go for the do-it-yourself approach. Take the Church of the Merciful Savior in the southern Russian city of Rostov-on-Don: its congregation meets in a former cafeteria on a busy road in the city's industrial zone. It's a low, concrete building that doesn't look much different from the auto shops and tire dealers that line the road. The only outward indication that it's an Orthodox church is a small gold onion dome on the roof, topped with a cross. Inside, though, it's already packed with people, bowing and crossing themselves before the icons. There's a decorated Christmas tree and the icon of Jesus is shielded by an arch of fresh fir boughs. Rescue workers help Russian Orthodox believers marking Epiphany by swimming late Monday in a pond in Pushkin, outside St. Petersburg. Thousands of Russian Orthodox Church followers plunged into icy rivers and ponds across the country. In contrast to many churches in Russia, there are lots of young people here, and kids. People move about, lighting candles or placing 5-liter plastic water jugs near the altar, where the water will be blessed. The service starts at 9 p.m. and lasts nearly four hours, propelled by the singing of the priests and a remarkably good choir for a small congregation. Around midnight, people who plan to take the plunge start to gather on the icy slope above the pond. It's a few degrees above freezing, so the ground is a slurry of ice and mud. Most people wear swimsuits under their clothes, swinging their towels and underwear in plastic bags. Twenty-nine-year-old Artur Guzanov says this is his fifth year taking the plunge and his second time at this church. "Epiphany is purification," he says. "My soul is cleansed and I'm charged with a good mood for the whole year ahead." The place where people take the plunge is a small wooden platform with a hole cut in the shape of a cross that opens into the icy water of the pond. Two warmly dressed emergency medical technicians stand by in case anyone is overcome by the cold. At 1 a.m., the service ends with a peal of bells — well, not bells, exactly, but lengths of steel tubing hanging from a frame. The Rev. Vladimir Osiak and his deacons make their way down the slope, carrying candles and gilded banners from the church. He ducks under the icy water three times, crossing himself each time he rises. A couple of hundred parishioners follow, giving themselves to the power of the ritual and the shock of the water. "Good," one man told me. "Absolutely good."